The Soldier from Independence: A Military Biography of Harry Truman. Vol. I: 1906-1919. D. M. Giangreco. Lincoln, NE: Potomac Books, 2018. ...first, that Truman’s activities during [World War I] were far more interesting and complex than previously realized, and second, the man who later ordered the invasion of Japan in the face of massive casualty estimates understood exactly what he was asking of our soldiers, sailors, and marines, and understood it...as only one who had lived and fought for six days in a ‘cemetery of unburied dead’ could. Giangreco opens with an engaging description of Truman’s patience one night in October 1918 waiting for just the right moment to order artillery fire on a German position, resulting in the destruction of all four of their 77mm field guns. He then flashes back to describe briefly the teenage Truman’s life in Jackson County, Missouri, where, in 1902, he started work as a timekeeper and paymaster for a construction company. The next year he took a job as a bank clerk, where “Truman made what turned out to be a pivotal decision when he and other young employees at Kansas City’s banks were encouraged to join a new National Guard outfit being formed.” Having poor eyesight that made it impossible to attend West Point, Truman’s substitute was enlist in Battery B in June 1905. The book then follows his experiences in each of the next three summers training twice at Camp Folk near Saint Joseph and in between near Cape Girardeau, the latter leaving “a profound impression” because of close comradery while drilling with “the generous St. Louis guardsmen” of Battery A. “Truman took National Guard service seriously, and his diligence plus perfect attendance at battery meetings” earned him promotion to corporal. He had difficulty maintaining this pattern after he quit his banking job in the summer of 1906 to return to work on the struggling six hundred-acre family farm. When his term ended in June 1911, Truman did not reenlist, instead shifting his focus to organizing a Masonic chapter in Grandview. In June 1917, two months after the United States entered World War I, Truman joined the new Battery F of the 2nd Missouri Field Artillery Regiment, and his comrades immediately elected him one of the unit’s five commissioned officers at the higher rank of first lieutenant. In August, the U.S. government federalized the National Guard, and in September Battery F traveled to Camp Doniphan at Fort Sill in Oklahoma for seven months of training. There, among other duties, Truman welcomed the opportunity to run the canteen—a post exchange—with Private Edward “Eddie” Jacobson, who had been his friend since banking days. Their efficient operation produced profits for the regiment because of Truman’s “aggressive, strictly business approach,” earning him the nickname Lieutenant “Grab-all” and then “Trumanheimer.” As for training, Giangreco explains how “the daily grind centered around horses, cannons, horses, the nearly impossible job of keeping things clean, and horses.” Truman was an excellent leader, taking advantage of his temperament and experience to win the respect of his men. He dealt creatively with shortfalls in ammunition, half the needed guns, and a lack of topographical and observation equipment. Truman also developed a reputation as “a hotshot when it came to gunnery.” Giangreco writes that he “excelled at observing and adjusting the fall of shot.” He also frequently served as a judge in courts-martial, while continuing to recruit for the Masons. Leaving Hoboken, New Jersey, on 29 March, the trip across the Atlantic to Brest in France took thirteen days. “What followed was the most intensive six weeks of study he had ever experienced,” Giangreco writes, “the course of study divided into five parts: ‘Elements of Firing, II Calculation of Data, III Ranging & Observation, IV Keeping of Records, [and] V Actual Firing.” Truman received promotion to captain just before completing his studies, and on 11 June, traveling east by train to Angers, his commander transferred him to become 2nd Battalion adjutant. Soon after, Truman’s unit received its first French 75mm guns and caissons, as well as horses, most of which “were weak castaways of the French Army’s earlier battles....” Moving to Coetquidan, the artillerymen began two months of training, finally receiving abundant French equipment and ordnance. Halfway through this period, Truman assumed command of Battery D, comprised, he wrote, of “the wild Irish and German Catholics from Rockhurst Academy,” a Kansas City high school, who “had had four commanders before me.” Nicknamed Dizzy D, many of its members were at that time under arrest in quarters because of disorderly conduct, including “drunkenness, refusal to obey orders, and failing to report for reveille.” Truman met with the non-commissioned officers and ordered them to establish order to the unit. When one tried, a huge brawl ensured. Truman sent a strong message when he demoted the perpetrators. Giangreco makes an important contribution in describing how Truman won the respect and loyalty of those under his command, quickly transforming Dizzy D into an effective fighting force. Transferring malcontents, he utilized punishments and rewards to assert his authority. More important, Truman improved the mess food and showed a sincere personal interest in each of his soldiers. Within a week, Battery D was posting the best scores in firing drills. Giangreco also notes Truman’s luck when Lieutenant Victor H. Housholder joined the unit as his executive officer, with regular examples thereafter of how he was “a virtual alter ego to his captain.” No longer a pariah after just five weeks under Truman’s command, Dizzy D had set firing and logistical records when it arrived at the front on 20 August 1918. Paperwork, meetings, and inspections consumed Truman’s time until he traveled to where his unit would deploy just west of Kruth. He recognized that the site needed extensive preparation before his men could install the guns, sending Housholder back to the unit to gather supplies and select a work detail. “Battery D’s guns, caissons, rolling kitchen, and most of its supply fourgons,” Giangreco reports, “were brought up on schedule, without incident, and with no horses falling out.” Leaving behind excessive consumption of alcohol, battery members arrived at the site and worked hard placing the guns, as incidents of misbehavior disappeared. This book provides some insights on military and strategic issues, but it has a different purpose, which is to describe events that helped form the beliefs and shape the character of a future president. Giangreco achieves this goal in a well-written study that entertains the reader with interesting anecdotes. We learn, for example, that Colonel Robert M. Danforth, one of Truman’s superior officers, co-authored the lyrics of the artillery’s inspiring anthem “The Caissons Go Rolling Along” while stationed in the Philippines. Along with one cartoon, 35 photographs show not only Truman, his soldiers, and his commanders, but also artillery and battle scenes from his service in the war. Giangreco provides good descriptions of weaponry, and his research is outstanding. He brings a “fuzzy picture” from Truman’s notes thirty years later as a U.S. Senator about his six years as a citizen-soldier into focus using “Missouri National Guard records and newspaper accounts of his unit’s activities.” For the wartime period, Giangreco references oral histories, but relies more heavily on Truman’s numerous notebooks. He makes excellent use of the multiple weekly letters Truman wrote to his girlfriend Bess that are rich in detail. His words often expose racist attitudes, yet Truman, as president, would be a champion of minority rights in the United States. James I. Matray has published more than fifty articles and book chapters on U.S.-Korean relations during and after World War II. His most recent of nine books is Crisis in a Divided Korea: A Chronology and Reference Guide. Matray also is Editor-in-Chief of the Journal ofAmerican-East Asian Relations. 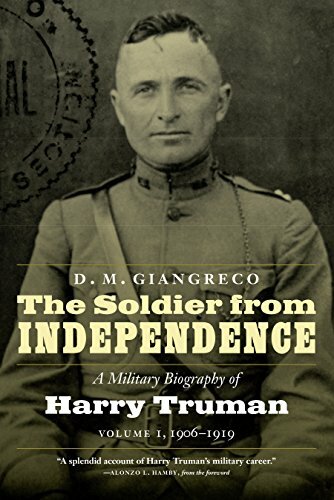 D. M. Giangreco, The Soldier from Independence: A Military Biography of Harry Truman. Vol. I: 1906-1919 (Lincoln, NE: Potomac Books, 2018), xi.